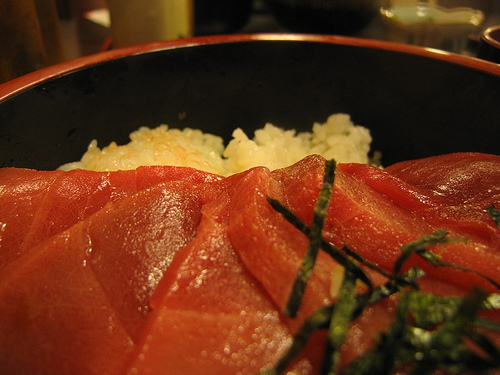 Food Costs > How Much Does Bluefin Tuna Cost? How Much Does Bluefin Tuna Cost? The bluefin tuna is native to the Atlantic Ocean and the Mediterranean Sea and are known to grow up to 10 feet long. Rivaling the marlin and swordfish, this fish can weigh close to 1,000 pounds and considered to be a delicacy around the globe, often referred to as the filet mignon of seafood. Highly prized as food for sushi and sashimi, this fish has been heavily targeted by the raw fish market. Traditionally, the cost of bluefin tuna will depend on where you purchase it from, the quality of the cuts, and if buying local, where you live. How much does bluefin tuna cost per pound? On average, plan on spending anywhere from $15 to $45 per pound at a local fresh fish market. Purchasing it from an online retailer that already has it prepared can cost you closer to $30 to $170+ per pound, according to our research. The costs, from what we saw, was really dependent upon where you purchased it from and where the fish was harvested. But, 99 percent of the time, you will find it’s almost next to impossible to find it online. This fish, in Japan, is considered to be a highly prized fish for raw dishes, and according to Wikipedia, close to 80 percent of bluefin tuna caught will be consumed in Japan. Researching prices paid in Japan, it isn’t uncommon to see $100,000+ purchases. In 2016, for instance, a sushi chain in Japan paid $117,000 for a 441-pound bluefin tuna, effectively bringing the price down to $265 per pound. Even though the price was much higher than average, the high price, according to buyers, was due to the high quality of its shape, color and fat. According to that same article, a 490-pound bluefin tuna, caught in the same waters, sold for a whopping $1.8 million in 2013, making it the expensive fish ever sold. The Giovanni’s Fish Market online offers sushi-grade bluefin tuna, and while it’s available in spurts, the price, when in stock, can be in the $30 per pound range. If found at a local sushi restaurant, for instance, prices can range from $90 to more than $150 per piece. At the time of this writing, we did find this NOAA.gov guide, showcasing the current wholesale market prices. Keep in mind, the following averages were as of May of 2017. According to the report, the average price range, converted to USD, was anywhere from $12 to $77 per pound for fresh domestic bluefin tune, whereas frozen was in the $21 to $50 per pound. Again, these were the market conditions and can greatly fluctuate. Refer to the link to see the current prices on the market. The belly fat, commonly referred to as toro, has a higher fat content, resulting in a pink to white color versus the deep red commonly seen in the center. The average 1,000-pound bluefin tuna will only yield about five pounds of toro. Bluefin tuna is one of the highly prized types of tuna, primarily used for sushi, nigiri-sushi, sashimi, in tartar or as crudo. While it can be cooked, similar to other tuna filets, chefs recommend lightly searing as you would a medium rare steak. Bluefin tuna will be found in offshore waters, ranging from the northern Pacific Oceans to the Sea of Okhotsk. Local bluefin tuna, if purchased in the United States, will come from the Gulf of Alaska to Baja, California. Some markets may also source from overseas, from the Phillippines to Mexico. If purchased online, many fisheries will charge an expedited shipping fee, especially if the minimum amount isn’t spent. Due to the sensitivity of the delivery, most shipments have to be at your doorstep within 24 hours to preserve the filets freshness while in transit. While considered overfished, it still isn’t considered a threatened species. The United States, at the moment, is working with the ICCAT to rebuild stocks and ensures professional fisheries adhere to strict standards. All reputable fisheries will be regulated by the International Commission on Conservation of Atlantic Tunas. Substitutes such as the yellowfin tuna and swordfish, while it won’t have the same exact taste, can taste similar and will cost much less.